When Did You Last Tune Your Rig? While most racers go to extremes to keep their rigs tuned perfectly, cruisers can have a more set-it-and-forget-it approach. 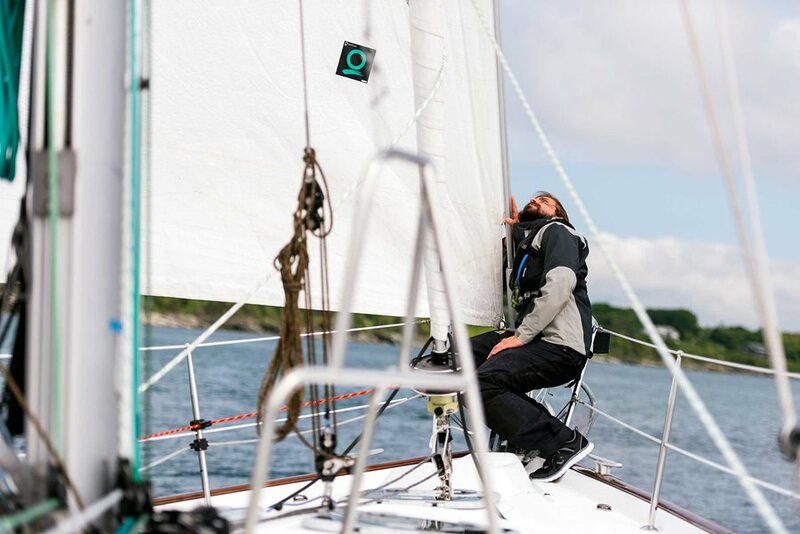 Quantum sails consultant Alex Clegg talks about the importance of proper tuning for your cruiser, and shares a few tips on how to make sure your rig is properly tuned. When it comes to cruising sailboats, some of the most ignored pieces of equipment are the mast and sails. While the sails come off once a year for storage (allowing any issues to be spotted) the majority of cruising sailboats rarely tune their rig or even take it down, so problems arise there more often. Rig tune and maintenance are frequently referenced in the racing world, but sometimes can intimidate cruisers and weekend warriors. Usually the rig is ready-to-sail on new boats, and it often goes untouched for a long time after that. Eventually, however, rigging and fittings can settle in and stretch, or worse, vibrate and become loose. This can affect furling systems, sail shape, and rig tension. It can also lead to damage or low performance in any of those areas. A loose rig is much more dangerous and potentially damaging to a cruiser than an over-tight rig. It may be hard to notice if a mast is not in column on a cruising boat, but your sail shape directly relates to the tension and straightness of the headstay and mast. An improperly tuned rig can have a big effect on sail draft, weather helm, and point. It’s analogous to having the steering in your car aligned: you want it to go straight down the road and not vibrate, ride rough, or pull to one side. Car alignment will make your tires last longer; proper rig tune can help your sails last longer as well. When purchasing a new sail, the sailmaker should assist you in checking the rig tune and help correct any problems (within reason - if there’s a worn piece of rigging, such as a turnbuckle or broken shackle, you may need a professional rigger to replace it). You can always call your sailmaker for assistance, but it's a good skill to know how to address yourself, too. Below are the main three items we usually check on the rig of a cruising boat. As you go through this process, consider creating a tuning chart to help make it easier to repeat the settings that are working. Click here for some brief notes on creating your own chart and how to do it. Is it straight side-to-side when sighting up the mast? We also see if it’s straight in the boat relative to a ninety degree – is the tip of the mast directly in the middle or off to one side? To check columnar straightness, start by evenly easing off the tension of the side shrouds, allowing the stays to be adjusted by hand. Loosen anything that might pull the mast to starboard, port, forward, or aft, such as halyards. To see how straight your spar is, sight up the backside of the mast. You can also use a masthead halyard to get a more accurate reading by cleating the halyard and marking where it intersects on both the starboard and port sides, then comparing your measurements. Using hand tension only, use the upper shrouds as your controls for centering the masthead. As you tension one shroud, be sure to loosen the opposite shroud the same amount. Work from the top shroud down. Once you feel confident in the straightness of your mast, tighten the shrouds evenly using tensioning tools. Keep an eye on the column of your spar as you go. Also be aware of what your mast looks like when you’re out sailing, not just on the dock or mooring. The mast will slightly fall off to leeward with a fair curve, but shouldn’t have any S-curve. If the middle of the mast is bent to weather and the tip to leeward, your rig is definitely out of tune. This will depend on the type of rig – fractional versus masthead and in-mast furling versus straight hoist – but the principles are the same. Straight or slightly bent aft are okay – you never want the tip bent forward relative to the rest of the rig. For an in-mast furling boat, you want minimal fore and aft bend to help keep the mandrel aligned and spinning freely. When sailing in stronger breeze, you could certainly try to induce some bend and reduce helm with the backstay, but to furl in and out you want the mast very straight. We also need to look at headstay tension and halyard tension for the genoa or jib. You can see the sag to leeward on the headstay by sighting up the forestay while sailing. Look for the deepest part of the sag. You don’t want a completely tight headstay, but you also want to keep the sag to less than a foot. Adjusting the backstay (if it is adjustable) and the genoa halyard can change this. An important tip is to ease some of the halyard tension when you’re done sailing, especially if you’ll be leaving the boat for an extended period of time. Sails that are furled up and extremely tight on the halyard will not last very long. Be sure to put a little more halyard tension on for a windy day, but remember to ease it later. Lastly, when I deliver sails to a cruising boat, I do a quick once-over of the rigging – standing and running. Is there a burr in the wire rigging? Or a cotter pin exposed? A frayed halyard? Corrosion on the gooseneck? These are items that can easily go overlooked, but a cotter pin poking through rigging tape will tear a genoa during a tack pretty quickly – don’t damage your sails by things that can be easily avoided. Knowing what to look for and how to correct problems will keep you on the water longer while preserving the life of your rig and sails.